"New tomographic techniques (micro-seismical and geoelectrical) for the non-destructive testing on masonry structures"
M.Marchisio, L.D'Onofrio, A.De Falco, L.Frediani, F.Guidoni. The Geophysical Section of the Dipartimento di Ingegneria Civile of the University of Pisa has been active in researches on the application of non-pervasive geophysical surveys on the masonry structures of historical buildings for more then ten years. We used mainly micro-seismic methodologies, both with refraction profiling and tomographic techniques. Recently we started using the shear waves besides the pressure waves that we used until now. The aim was to increase the resolution, as the S-waves have smaller wave-lengths, and to allow an estimation of the Poisson modulus by a dynamic method. Several specific new tools have been designed and set-up for the generation and acquisition of the S-waves, that require a more delicate technology with respect to the P-waves. A series of experiments under different conditions gave very interesting results. 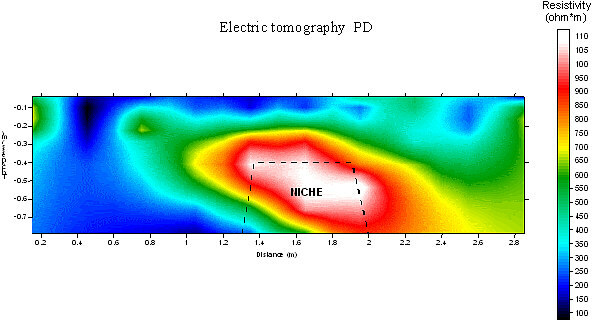 Also the technique of geoelectrical tomography has been used for several problems: it proved to be effective in showing areas with anomalous humidity and in individuating voids. The use of micro-geophysical techniques offers many advantages with respects to some "classical" techniques under different angles: velocity of execution, non-pervasiveness and costs. The idea of adapting some of the classical geophysical survey methodologies as Non-Destructive-Testing on masonry structures is not so strange. These methodologies were actually developed to explore the subsoil by means of several kinds of physical measurements performed at the surface of the Earth: in effect they can be seen as "non destructive tests" of the subsoil. The aim originally was to look for natural resources. These various families of methods form the body of Applied Geophysics. As the information on the presence of geological bodies or structures in the subsoil must be inferred by measurements carried out at the surface, the geophysical methods are indirect: the data need to be processed and interpreted to obtain the needed information on the subsoil. The problem of investigating the hidden structures or particularities of a masonry structure from the surface is in principle quite similar. Of course some physical properties are different, and the scale of the experiment is several orders of magnitude smaller. The first decision is to choose which of the Geophysical methods can be transferred and adapted to work in such a different environment. Next, the technological aspects must be faced up. In general the main problem is connected with miniaturisation of the instrumental arrays. In our experiments we investigate parts of the masonry structures of the order of magnitude of some meters: this is for us an optimum size of the specimen: it is a significant part of the masonry of the building, while going down to smaller scales could lead to measure the properties of the single stone or of the mortars. Among the other sites where we performed various tests and surveys, two buildings, the Cathedrals of Lucca (Tuscany) and Nicosia (Enna, Sicily), turned out to be very interesting, as they are actual important Middle Age monuments and they present very particular damages. The results of several surveys with different technologies will be presented. Two kinds of waves propagate in an elastic (homogeneous and anisotropic) body : the pressure (or longitudinal) waves, here referred as P-waves, and the shear (or transversal) ones, referred as S-waves. It has been shown that no other elastic waves propagate in an indefinite medium. Various visco-elastic models have been tried to the study of the propagation of seismic waves in actual rocks by comparing the model behaviour with the great amount of experimental data coming both from the passive seismology and the active seismic exploration. When a viscous component is introduced, an attenuation of amplitudes occurs and both attenuation and velocities depend on frequency. Among the different models, the most appropriate one resulted the Voigt visco-elastic model. It is very interesting that in this case, for the frequency range used for seismic (and micro-seismic) exploration, the attenuation is small and growths almost linearly with the frequency. The wave velocities depend very little on the frequency and do not differ much from the ones computed by the elastic model. This fact allows us to use the above quoted relations; they connect the seismic velocities with the elastic moduli. In presence of discontinuity surfaces, also other kind of waves propagate: the Rayleigh and the Love waves. Their velocity is definitely smaller than the body waves. P-waves propagate also in fluids (air, water,...) and correspond to the sonic waves. So it is equivalent to speak of sonic tests or micro-seismic test. When we introduce the S-waves tests,the sonic name cannot be anymore used, as this waves do not propagate in fluids. One of the problems, or actually the main problem, when we try to transfer the micro-seismic methods to the exploration of masonry structures, are the small dimensions of the targets, several orders of magnitude smaller than the ones in the subsoil, also in High Resolution Shallow Seismics. We need to measure with accuracy travel times that are much smaller than usual. This implies the need of working with much smaller wave-lengths. When working with P-waves (sonic tests) this means to use much higher frequencies. On the other side, high frequency signals suffer high attenuation. Ultra-sounds usually are completely attenuated at a small depth in the typical masonry of ancient buildings, also if new technology are incrementing their field of application. We obtained good results working with signals in the high sonic range. The necessity of working in this range requires to adapt all the instrumental chain: energisation systems, transducers, cables, recording system. Until now P-waves have been used for sonic and micro-seismic tests on masonry. This it the only approach for people working with sonic methods and the normal one in geophysics: most of seismic surveys are carried out with P-waves as they are easier to generate and to record. On the other side, the aim of obtaining a higher resolution, that requires to record signals with smaller and smaller wave-length, can be searched in another way: instead of looking for higher frequency signals, it is possible to use the S-waves. In this case smaller wave-lengths can be obtained thanks to their lower velocity. S-waves are more and more used also in field seismic prospecting to obtain Ultra-High Resolution (UHR). In that case, SH-waves are used, that is, the S-waves polarised in the horizontal plane. We maintain this terminology, also if our working "horizontal" surface is often vertical. Some special energy source must be used to generate mainly SH-waves with enough energy. The receivers must be "horizontal", that is to record the vibrations parallel to the wall surface. We are using horizontal geophones with a disposition similar to the SWYPHONE (see Sambuelli et al, 2001) system that has been developed for UHR. A lighter device is under development. The visible effect of the use of S-waves, due to their lower velocities, is the bigger interval between the arrival of two nearby geophones. This fact corresponds to the possibility of using smaller spacings among the receivers, that is, to increase the number of receivers on a certain profile length. The same can be done to the interval among the shots. The result is that the coverage of a tomographic section can be made with a number of rays four times bigger or more. The same increment applies to the number of "pixels" or cells of the tomographic inversion, that is to its resolution. We are using different classic field procedures or "seismic methods" for the NDT of masonry structures. velocity measurements along surface profiles using the experimental methodology of the Seismic Refraction. We call them "velocity profiles" as the aim is not the individuation of higher velocity layers under the surface one (an occurrence rather unusual in masonry structures). A string of receivers (typically 6-12) are placed along a straight profile on a masonry surface. Shots are made at the extremities of the profile. The arrival times are plotted versus the distance of the geophones from the shots (these graphs are called dromochrones): their slope allows to obtain the velocity of propagation of the waves. This method is more reliable than the typical two-point sonic measurement as from the dromochrones it is possible to control the results and to individuate the effect of discontinuities, plasters or other inhomogeneities. See Fig.1.a. transparency bi-dimensional Tomographies, with the experimental disposition of the "cross-hole tomography" in the subsoil. In this case a series of receivers is fixed along one profile on one side of a masonry structure. Numerous energisations are made along a parallel profile on the other side. The seismic rays "cover" a plane section across the wall. By measuring the travel time for each ray, it is possible to enter a software package for the reconstruction of the distribution of the sonic (or seismic) velocities in the plane. This is obtained by dividing the section of the survey in rectangular cells (pixels). The number of the cells must be smaller than the number of the data. Iterative reconstruction of the seismic raypaths and of the velocities in the cells are performed by various algorithms. The graphic representation of the velocity distribution is performed by graphical software by contouring and colour-scales. The result is the sonic tomographical image or tomography. It is worth to note that this method not only is not defective in presence of internal inhomogeneities, but it is a powerful to put them in evidence. See Fig.1.b. mono-dimensional Tomographic Seismic Soundings (TSS): when it is not possible to reach one of the surfaces of the structure, it is possible to obtain information on the internal velocity distribution by using a borehole in the thickness of the masonry. In this case, we should actually speak of MDT, but boreholes are often foreseen also for other necessities. TSS measurements are made with receivers in the hole and shots along one profile at the surface. The travel times can be processed by a special software (that we called TSS) to obtain a profile of the velocities along the hole. The algorithms are similar, but the pixels are no more 2D (rectangular cells) but 1D (mini-layers). This procedure turned out to be able to obtain a very high resolution, specially when looking for thin low-velocity layers. It is a useful tool to individuate the different layers or leafs of a masonry. When possible we perform two or more TSS for each borehole, changing the shot profile: in this way it is possible to perform different independent "experiments" in the same spot. See Fig1.c. Fig 1: The Source-Receivers layouts corresponding to the above mentioned methods are shown. a high quality recording seismograph, min. 24 channels. The essential specifications must be a very high dynamic range for the acquisition and analogue-to-digital conversion: modern instruments have A/D converters with more than 20 bits (our instrument, for instance, has 24-bit Delta-Sigma Technology A/D converters). A high frequency band-pass is essential to record the very high sonic frequencies (our seismograph has been specially modified to allow a band-pass of 20 kHz). a suitable energy source (with a triggering device). The most common source is some kind of hammer hitting a steel plate. There is also the possibility of using some electromagnetic device with a structured signal. receivers (at least 6-12 for profiles or TSS; 12-48 for tomographies). As we try to record signals with a high frequency content, the transducers for P-waves must work in the high sonic frequencies, higher than the one used in the field: there is a gap in the market in this range. At present we work with very small items that arrive up to 4-5 kHz. shielded cables, special connectors, etc. As we mentioned before, the Cathedrals of Lucca (Tuscany) and Nicosia (Enna, Sicily) turned out to be very interesting test-sites for our surveys. The Cathedral of Lucca is an important Romanesque church whose construction dates back to the XII-XIV centuries. Some symptoms of an anomalous situation in the left transept of the Cathedral of Lucca were discovered by chance a few years ago. The internal part of the wall at both sides of a portal was damaged due to water infiltration. Some seismic tomographies were the first tests to make clear the critical situation. Due to the high loads, the static equilibrium conditions appeared extremely dangerous. The left transept was closed and the portal was walled up. A series of seismic tomographies were performed also across other parts of the church. Luckily the rest of the building did not show other problems. The tomographies put in evidence that important parts of the internal masonry structures were strongly degraded; they showed also some interesting structural details. Our description of the situation has been confirmed by numerous other tests (endoscopies, etc.) and by the historical investigations. Due to the very particular situation, these walls have been used as a test site for the new technical improvements or for other methods: P-waves tomographies were repeated with new pieces of equipment; the feasibility of S-waves tomographies was first tested here, while later a high-resolution test was performed; georadar was tested with various antennas' arrays (the humid damaged areas were spotted out by the signal attenuation); our first geoelectrical tomographies too were carried out on the damaged section of the transept. Nicosia, a small town in central Sicily, is extraordinarily rich in monuments, churches and palaces. The Cathedral was built in XV century in Aragonese Gothic style and changed in Baroque two century later. Due to the age and some works carried out at the end of the last century, some damages were evident. Unhappily 25 years ago an important restoration campaign was performed with a technique of high-pressure injection of cement grouting with steel bars. This technique seemed to promise miracles, but, due to the presence of sulphur traces in the materials, dilatation phenomena occurred with the formation of ettringites. The result was a real disaster, spread from the foundations to the roof. The stone elements (pilaster strips, cornices and mouldings) of the swollen walls were pushed away, detached and broken. Also the floors were swollen. The mortar that gushed back at the surface showed very low resistance. The problem was to try to evaluate the stiffness of the internal part of the structures and the extension of the damage. We proposed an extensive survey with micro-seismic methods. No other technique seemed suitable. Due to the extension of the damage it was not possible to limit the survey to a sampling of some typical elements: measurements were made practically everywhere possible, from the foundations (where exposed) to the roof, internally and externally. Also the bell tower was surveyed. Finally we had: more than 600 velocity profiles measured along almost 100 geophone arrays; 10 transparency 2D tomographies through the structures and 15 SST tomographic velocity profiles obtained by means of 6 boreholes, for a total of almost one thousand seismic recordings. It came out one of the most extensive surveys of this kind. 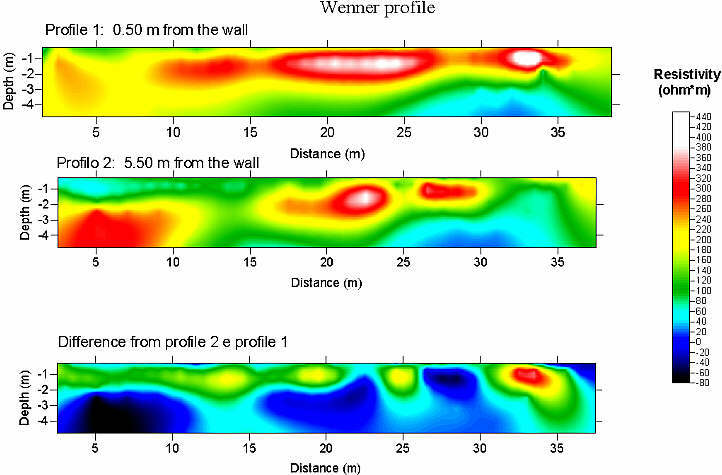 Fig 2: a)Profile in a regular zone b)Profile in a zone with deep cracks c)Profile in a zone with surface irregularities. Fig 3: A a) P-wave tomography across a wall section of the Cathedral b) A P-wave tomography across a wall section of the Bell Tower. In Fig. 2 several examples of velocity profiles from the tests performed in Nicosia are shown. In 2a two rather regular profiles (direct and reverse) are shown: the dromochrones are straight and the velocities can be easily evaluated. In 2b each profile has a "jump", but the segments before and after are straight: the discontinuity is due to deep cracks that were caused by the installation of a chain but the above and beneath masonry is stiff. In 3a a case that gave a "bad" response is shown: it was caused by plaster detachments, cracks, inhomogeneities. In such case we are well alerted that the answer is not reliable. In both cases medium-low average velocities are 800-1000 m/s that correspond to E values of 10-15000 daN/cm2. The presence of several injected bars near the tomographic sections are spotted out as high velocity anomalies. A halo of very low velocities appear around each bar. In Fig. 4 two cases of TSS are shown. As mentioned before, when possible 2 or 3 TSS were performed in each hole. In Fig. 4a two TSS made in the same hole are shown. They were made in the bell tower. The two tomographic soundings are very similar. They evidence a more rigid external face and a medium low velocity for the internal structure. In Fig. 4b the tomographic soundings in a hole in the foundation wall under the transept are reproduced. Two TSS are regular, while the third (interesting the upper part) shows the effect of the presence of one of the injected bars near the hole. 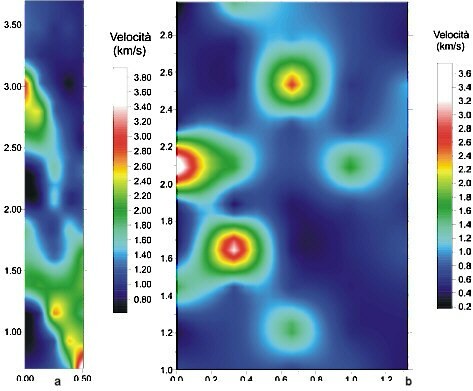 Fig 4: a)Two very similar tomographic soundings in a wall of the bell tower. b)Three TSS in the foundation wall under the transept. One of the soundings is interested by a bar and shows an evident anomaly. In Fig. 5 two tomographies from the Cathedral of Lucca are shown. They were measured on the damaged wall at the entrance of the North transept. Fig 5: a) It is a P-wave tomography. It shows clearly several areas with very low velocity. b)A recent experiment obtained by using S-waves is shown. While the general trend is similar, the image has much more detail. Fig. 5a is a P-wave tomography measured across the damaged wall of the North transept. It shows clearly several areas with very low velocity. The corresponding moduli of Young are under 2-3000 daN/cm2. Some high velocity spots correspond to rigid stone structures connected to the nearby corners and to the structures of the portal. In Fig. 5b it is presented a recent high resolution experiment obtained by using S-waves. While the general trend is similar, the image has much more detail. In this case in fact the distances between adjacent shots or geophones were reduced to the half or less. The total number of measured travel times was 588 (instead of 144 for the P-waves tests). This allowed to divide the section in much smaller cells (7x20 cm) for the tomographic inversion. Some tests were performed to obtain geoelectrical tomographies across masonry. Different methods can be used. The transparency or cross-hole tomographies use an experimental disposition of the electrodes corresponding to the "cross-hole tomography" in the subsoil. In this case 2 series of electrodes are fixed along 2 profiles on the opposite faces of a masonry structure. Another technique uses only one profile with many electrodes on one face of the structure. Measurements are made with the technique of the so-called resistivity pseudo-sections by connecting 4 electrodes at a time with one of the typical arrays used in geoelectrics. By connecting the electrodes in different combinations, a good number of measurements are obtained (typically several hundreds). Multi-electrode (24, 48 or more) automatic switching geo-resistivity-meters are necessary. The measured data, namely the apparent resistivities, can be directly plotted versus some kind of pseudo-depths to build the so called pseudo-sections. These are purely qualitative images. By means of a complex inversion process, the distribution of true resistivities versus true depth can be obtained, that is, another kind of geo-electrical tomography. This is sometimes referred as the impedance tomography. Also in this case, the first experiments were carried out on the damaged section of the transept of the Duomo of Lucca, on the same damaged wall where we made the seismic tomographies. As the external stone face of the wall is very compact and the contact resistivities should be too high, we decided to perform an impedance tomography from inside only. The internal face, in fact, is a mixed bricks-stone wall, with thicker mortar joints, and it looked more suitable for this experiment. Twenty-four small metal electrodes were used in the same small holes made for the seismic receivers: they had been bored, when possible, in bricks or in the junction and not in the stones. A conductive gel was injected in the holes to ensure a good contact with the wall material. The input impedance was measured at all the electrodes couples: it was in the order of 5-10 kW, compatible with the instrument input impedance. The Pole-Dipole and the Dipole-Dipole electrode arrays were used. The apparent resistivity pseudo-sections were quantitatively inverted to obtain two electrical tomographies of the wall. The results are shown in Fig. 6. The presence of low-resistivity zones put in evidence the damage due to the water infiltration. The general trend of these anomalies is rather similar to the distribution of the low-velocity areas in the seismic tomographies. Another test was performed on the external face of the walls of Vicopisano, a small town near Pisa. The middle-age stone walls were reinforced, in the XV century, by several towers and more complex gates. The walls about 6.5 m high and about 0.9 m thick. Two tests were made with the electrodes fixed along a horizontal profile on the external face (impedance tomography). The result is shown in Fig 7. Please note that the Pole-Dipole array is asymmetrical: so the anomaly due to a niche on the back side of the wall is deformed, but the localisation and the depth of the cavity is quite good. 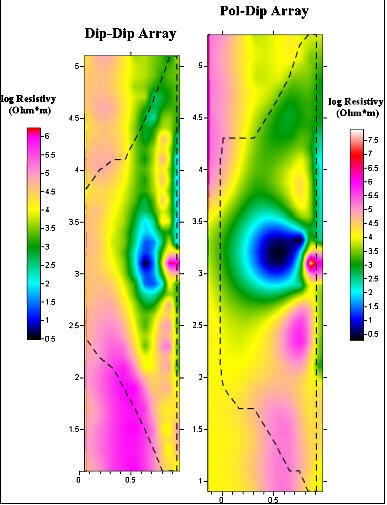 Fig 6: Two geo-electrical tomographies across the same section of the seismic tomographies shown in Fig. 5. The internal conductive zones put in evidence the water infiltration in the damaged areas. Fig 7: A resistive anomaly is well visible: it correspond to a niche on the other face. Fig 8: Geoelectrical tomographies performed on the ground near the wall of Vicopisano allow to evaluate the depth of the foundation (2-2.5 m). Two geoelectrical tomographies carried on the ground near the same wall helped to estimate the depth of the foundations ( Fig.8): The first one was obtained with a profile near the wall (0.5 m); the second one, not be disturbed by it, was made more than 5 m away; the third figure was obtained by subtracting, point by point, the "undisturbed" values from the first one. The depth of the foundations can be estimated to about 2-2.5 m. The presence of subsurface anomalies is put in evidence. The use of several high-resolution methods derived from the geophysical survey techniques proved to be very effective in the Non-Destructive Testing of masonry structures. In particular the application of a tomographical approach allows to obtain images of the cross-sections of the masonry that clearly show the presence of eventual anomalies. Our research is aimed to increase the resolution: as the micro-seismic tomography is a procedure, not a single "instrument", we worked on the different phases of the data acquisition and processing. For the sonic or, better, the micro-seismic tomographies, while working on the data acquisition for sonic or P-waves (sensors, energisation tools, instrumental and data processing), we started to test the possibility of using the S-waves: the first tests showed the feasibility. A further test in Lucca's Cathedral allowed us to obtain a resolution four times bigger than the sonic tests. An interesting aspect of these methodologies is that they combine the capability of pointing out hidden anomalies (layering or leafs, cavities, variations of the materials, defects...) with the possibility of deriving from the velocities the values of the dynamic elastic moduli of the materials. Some experiments with geoelectrical tomographic techniques gave very interesting results also when working on stone masonry, that seemed a hostile environment for geoelectrics. This is very interesting also due to the velocity of the measurements and of the data processing: this means short times and low costs. In conclusion, the improved tomographic techniques are a powerful and cost-effective tool for the non-destructive testing on masonry structures. W.M.Telford, L.P. Geldart, R.E.Sheriff, D.A.Keys (1981): "Applied Geophysics". Cambridge University Press. K. Dines, J. Lytle (1979): "Computerized geophysical tomography". Proc. Inst. Electr. Electron. Eng., 67, pp. 1065-1073. S. Ivansson (1983): "Remark on an earlier proposed iterative tomographyc alogorithm". Geophys. J. Roy. Astr. Soc., n 75, pp 855-860. L. Lines, S. Treitel (1984): "A review of least-squares inversion and its application to geophysical problems". Geophys. Prosp. n 32, pp 159-186. M. Worthington (1984): "An introduction to geophysical tomography". First Break, Novenber, pp. 20-26. M.Marchisio, E.Forlani: "Nuovi contributi della geofisica alla previsione di stabilita' dei versanti". Quarry and Construction, 1993, 4, 65-68. M.Marchisio, L.D'Onofrio, E.Forlani: "SST - A Tomographic VSP Technique for Geomechanical Applications".I Meeting EEGS - European Section, Torino, 1995. N.Gucci, M.Marchisio, M.Sassu: "Tecniche sperimentali comparate per la diagnostica di murature miste". 7 Atti Convegno ANIDIS, Siena, 1995. M.Marchisio, L.D'Onofrio, E.Forlani, S.Cerri "The use of geophysical methods to study the masonry structures of monuments: an application for the restoration of the Cathedral of Nicosia (Sicily). Proceedings of the 6 Meeting EEGS - ES, Bochum, Sept. 3-7, 2000. A.D. Seagar, R.H.T. Bates (1984): "Full wave computed tomography. Pt.2: Resolution limits". IEE Proceedings, Vol.131, Pt.A, n.8, pp.616-622. T.J. Yorkey, J.G. Webster, W.J. Tompkins (1986): "An optimal impedance tomographic reconstruction algorithm". IEEE/Eight Annual Conference of the Engineering in Medicine and Biology Society, pp.339-342. D.C. Barber, A.D. Seagar (1987): "Fast recostruction of impedance images". Clin. Phys. Physiol. Meas., 8, suppl.A, pp.47-54. M. Noel, R.Walker (1990): "Development of an electrical resistivity tomography system for imaging archaeological structures". Proceedings Archaeometry '90, Birkhäuser Verlag, Basel.L.P. M.H. Loke, R.D. Barker (1995): "Least-square deconvolution of apparent resistivity pseudosections". Geophysics, Vol.60, n.6, pp.1682-1690. J. Zhang, R.L. Mackie, T.R. Madden (1995): "3-D resistivity forward modeling and inversion using conjugete gradients". 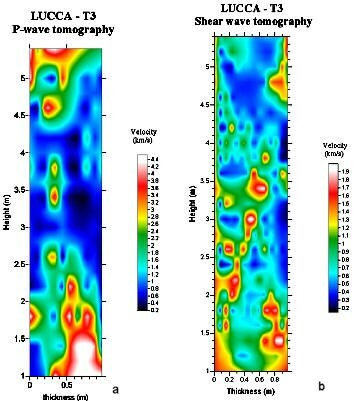 Geophysics, Vol.60, n.5, pp.1313-1325. D.J. Labrecque, G.Morelli (1995): "Advances in ERT interpretation methods". Proc. 1st Meeting on Environmental and Engineering Geophysics, pp. 344-347. Torino. G. Morelli, D., J. Labrecque (1995): "Occam inversion of 3-D ERT field data". Proc. 1st Meeting on Environmental and Engineering Geophysics, pp. 351-354. Torino. L. Sambuelli, G. P. Deidda, G. Albis, E. Giorcelli, G. Tristano (2001): "Comparison of standard horizontal geophones and newly designed horizontal detectors". Geophysics, Vol.66, n.6, pp.1827-1837.